It’s a phrase you probably heard from your high school English teacher when you turned in a 10-page essay that was supposed to be five pages long. 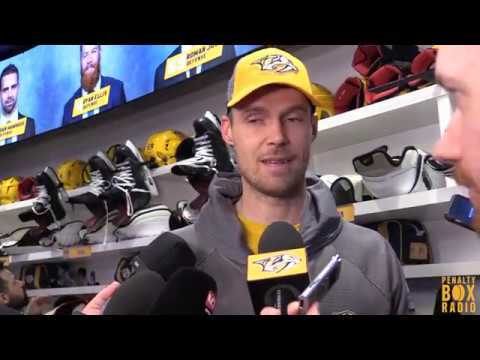 For the Winnipeg Jets, that was the golden phrase on Thursday night against the Nashville Predators, as they came away with a 5-1 win despite a possession advantage in favor of the Predators. The Predators won the shot attempt battle in two out of three periods and in the game as a whole according to Natural Stat Trick, but it was the quality of the chances that put the Jets over the top. While Nashville owned 52.75% of the shot share, Winnipeg owned 64.29% of the high-danger scoring chances. That gap was the difference between a tightly-contested thriller and a game that was over by the midpoint of the third period. That’s because the disparity between the shot chances and high-danger chances came about as a result of issues on both sides of the ice. Even when the Jets weren’t scoring, they were able to generate scoring chances directly in front of goaltender Pekka Rinne. The heat map from Natural Stat Trick shows just how much of Winnipeg’s offense was generated from high-danger areas. The game could have snowballed a lot quicker if it weren’t for a couple of key Rinne saves on Winnipeg’s Patrik Laine in the slot and another brilliant offside challenge by Predators video coach Lawrence Feloney to keep the score close in the first period. On the Jets’ second goal, Mason Appleton was able to walk right down the slot and tap in a feed in front from Joe Morrow. On the third goal, Bryan Little tapped in a wide-open rebound directly in front of the net. Players went undetected into high-percentage areas, and it cost Nashville. Overall, this was a game that was a solid test for a Predators team that now sits four points back of Winnipeg in the Central Division standings, but still a solid 11 points clear of the playoff cutoff. For a team that has much higher aspirations than just to be playing in April and May, this game was a solid demonstration of where they are right now and where they want to be.